Bottler Brown is having a torrid time, with one disaster and scandal after another. Is it a case of “when you are in a hole stop digging”, or just terminal sleaze and incompetence? In the latest scandal, New Improved Formula One Labour has once again been caught doing something that looks distinctly illegal and corrupt. Under current British law, it is illegal to make contributions to a political party through proxy donors. That hasn’ stopped the Blair Brown regime receiving at least GB£600,000 and that may be just the tip of the iceberg. Then it immerged that more and more officials and the Party hierarchy knew something, or everything, about it. So play the first misdirection – “can’t discuss it because a special inquiry has been set up under a judge, a bishop, and an actress” – Come on Bottler, jokes about the judge, the bishop, and the actress are as old as the hills!!!! So play the second misdirection – “cant call in the police because its a matter for the Electoral Commission” – Come on Bottler, the British police can investigate any complaint of criminality and have a duty so to do. If you wont call them the Lib Dems will!!! So play the third misdirection – “we introduced the law and we will tighten it to prevent any abuse (by other Parties)” – Come on Bottler, you only passed the laws to divert attention last time you were caught cheating. That law applied to you even if you may think you are above it. No new law is required – just compliance with the current law!!!! – although a change in sentencing options to again permit heads to be fixed on pikes outside Parliament would be good. So play the forth misdirection – “its all right because we have paid the money back” – Heard that one before Bottler. Are you really suggesting that a bank robber is immune to prosecution if he pays the money back to the bank from his next bank robbery? The person who paid the money illegally broke the law. The people who received the money broke the law. One criminal paying another criminal back does not remove the crime!!!! Norman Baker has included some of the theories for the justification of war, as they apply to his investigation of the very strange death of Doctor David Kelly. It is not an exhaustive list, but it is applicable to the primary question, which is whether David Kelly was killed, or died in some other way. The main focus today is on the relationship between Bush and Blair, with an assumption that the Bush Administration is driven by so called neocons. That is a simplistic view of the situation. The story really goes back into the Nineteenth Century when Americans were still committing genocide against the aboriginal tribes of North America and their black slaves were recently ‘liberated’. For a mixture of motives, some well-meaning and some deeply racist, a group of Americans hit on the idea of returning slaves to Africa. Liberia was a creation of this political and social concept. Black Americans were encouraged to ‘return’ to Africa, and that included those who had been born in America, knew nowhere else, and would have probably been happy to remain in the US, even without full and true emancipation. From those roots developed the idea that Jews should have a homeland. Although this suffered from a difficulty to decide whether being Jewish was a racial type, or people supporting a common religion. A very long time ago, a group of people around the Black Sea, who were not genetically Semitic, converted to the Jewish religion. Over centuries the descendents of these people may have inter-married with Semitic people, but some probably did not, and there have been many non-Semitic converts over the centuries. Without extensive genetic testing, it is impossible to know how many people genetically originated from the ancient tribes of Israel. In one sense it is not in the least important, but in terms of claims on an historic homeland it means that some people are claiming a homeland that is not part of their history in direct lineage and in several respects similar to the claims of European Crusaders on The Holy Land. What makes racism a farce is that humans are genetically very similar, where ever they come from, and groups have migrated so many times that any original groupings are long since lost. The result is that a person who takes a particular racist position might be in for a very sharp surprise when his or her DNA is checked. One place considered for this new Jewish nation state was in East Africa, although Zionists were always interested in a return to Palestine, which they regarded as their natural and historic homeland. Although, genetically, Jews and Arabs have far greater similarity than some politicians may wish to acknowledge, there was a wealth of cultural and religious difference. As a result, any mass immigration of Jews to Palestine was bound to create terrible tensions in addition to the tensions naturally created when any aboriginal population is faced with an influx of immigrants. At best, it was only a marginally better idea than trying to dump Zionists in East Africa. During the 1914-1918 War, the British allied themselves with the Arab tribes agains the Turks. That removed Turkish rule from the Middle East and it created a number of new nation states, for which Britain held a responsibility. From 1918, Zionists began to move into Palestine. Had there been no discovery of oil in the Middle East, history might have turned out very differently, but then it is also true that it would have been different without the 1939-1945 War. This war created two situations that were guaranteed to provide the basis of lengthy and bitter conflict. One factor was the large amount of weapons, and other military equipment, that was sent out for the British, Germans and Italians as the North African Campaign flowed back and forth. A great deal of this equipment ended up in the hands of Zionists and Arabs. The second factor was the genocide perpetrated against the European Jews by the Germans. That created a combination of guilt, horror and fear that resulted in massive movement of European Jews to Palestine, the opening of terrorist warfare by Jews against the British in Palestine and the forced creation of the State of Israel. Europe has tended to side more with the Arab nations and the US has tended to side with the Israelis, although the situation has been further complicated by the development of the Cold War which has seen Russia and NATO competing to back particular groups, where the strategic value of Middle East oil has been the strongest motivation. Taking in that context, the primary interest of the nations outside the Middle East is in the oil reserves located there. Within the Arab world there are a complex series of tensions and motivations that include religious differences, tribal differences, and political differences. Many of those tensions are not adequately understood by countries outside the area. Saddam Hussein was motivated to expand his personal power and wealth. This nationalist expansion was to result in a major and protracted war between Iraq and Iran, and the Iraqi invasion of Kuwait. The multi-national force that went into the Gulf in 1990 went in under a clear UN mandate and with the joint motives of restoring Kuwaiti independence and protecting oil reserves. Very wisely, the allied forces stopped at the Iraqi border having ejected the Iraqis from Kuwait. There was no mandate and no intent to effect regime change. It is easy to write the Bush Administration off as a bunch of warmongering red necks, but it is not an accurate assessment. Before the Bush Presidency, Clinton and Blair embarked on an invasion to effect regime change. It was aimed at supporting Al Qaeda and Albanian Muslim rebels against the Serbs. The justification was that the US and Britain would be protecting poor ethnic Albanians from Serb genocide. A propaganda campaign was launched, using selective intelligence and a great deal of spin. It created a modern precident for a war of aggression by large and powerful countries with the intent to effect a regime change. It also set the scene for the spinning of meagre and partial intelligence as though it was verified fact. Blair and Bush therefore followed a precident set by Clinton and Blair. The US was always open in describing the objective as being regime change to protect oil reserves for Americans and Europeans. However, the UN does not accept regime change as a legitimate reason for invasion of a sovereign State by another. This led to the US and British Governments largely ignoring their intelligence services and State Departments in favour of taking more favourable comment from Iraqi rebels, and other sources, which was then used as the basis for a propaganda campaign in an attempt to justify invasion. What was really unfortunate was that no one had thought what to do once the invasion had been successfully completed. The attempt to justify invasion on the groups of a supposed threat from Iraqi WMD meant that failure to find any implied a failure of mission. However, no one seriously believed that Iraq was about to launch World War Three with a massive stockpile of nuclear, chemical and biological weapons delivered by advanced long range missiles, or that Iraq was directly allied to Al Qaeda and responisble for the attacks on the US. Equally, those involved in intelligence gathering and analysis did not believe that Iraq was completely without such weapons and delivery systems. The popular belief within the intelligence community was that weapons inspections and sanctions had reduced Iraqi capability and what remained was scattered around the country in hiding places from which it would not be possible to bring the weapons rapidly to military forces for immediate use. After the invasion, when Bush and Blair admitted a failure to find the weapons, and an attempt to rejustify the invasion as freeing a people from cruel repression, the intelligence community was generally of the opinion that some small weapons stocks might remain well-hidden but, in all probability, the surviving WMD capability had been moved to Syria and Iran. Huge stocks of conventional weapons were left unsecured by the invasion troops and were looted by the various Iraqi factions who then began a civil war. That demonstrated just how easy it would have been to move small stocks of WMD and documentation to Syria and Iraq. Bush and Blair had put themselves and their countries in a very difficult position. The public justification for war was that Iraq posed a clear and present threat to its neighbours and to Europe with an intent to launch unprovoked war using weapons of mass destruction. Finding a few dispersed legacy stocks of WMD would have been even worse than finding nothing because it would have directly exposed the lie on which war was justified. Finding evidence that remaining stocks had been moved to Syria and Iran was equally unwelcome because it would have required new campaigns against these WMD threats at a time when Bush and Blair were discovering that there was no universal Iraqi resistence to Saddam and the Ba’ath Party and therefore no government in waiting who could be installed. The realization was dawning that all the previous intelligence advice was correct and Iraq was in immediate danger of becoming a new Balkans and Sunni and Shia Muslims were about to fight each other and the Kurds. This mean that the main achievement of the Anglo American military invasion force was in providing a focus for these warring groups against the invader. That suggested a total disaster if the invaders withdrew and the Iraqis had only each other to fight. Inevitably Syria and Iran would support rebel groups and Al Qaeda would greatfully seize the new opportunity to cause death and misery to civilians. It is now clear that at least one faction in the Bush Administration saw Iraq as the beachhead from which to launch a series of wars of reconstruction against neighbouring states and particularly against Iran and Syria. That approach required the early establishment of a quisling government in Baghdad, to free US forces for new actions in the neighbouring countries. Without that puppet government, the US did not have the resources to guard the camps in Iraq and strike out against new targets. That prospect became progressively more remote as US public opinion became less supportive of the Iraq adventure. 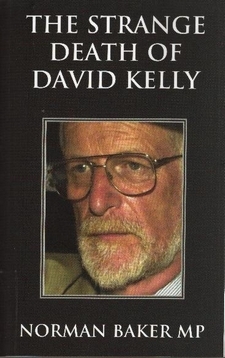 The growing mess, in which Dr David Kelly became trapped for no reason other than his honesty and integrity, created serious problems for people in several countries for similar and different reasons. Many of those people were not only frightened of the truth that he was assisting to emerge, but they were also sufficiently ruthless to think little of killing someone to remove an irritation. The stakes were higher for Blair because he had signed up to the International War Crimes Tribunal system. That meant that he and his Government could be brought before the Tribunal as war criminals. Bush was more secure because the US had not signed up to the scheme. On the other hand, there were some very dark elements around Bush who had considerable financial motivation to silence critics of the invasion of Iraq. To that has to be added the very complex tensions of the Middle East. From that ferment comes a rich area for conspiracy theory. Northern Rock is a problem that never seems to go away, however much the Blair Brown regime might wish it. So far it looks like GB£24 billion ( nearly US$50 billion ) has been committed to keep the deeply troubled bank from Administration (Chapter 11). Some experts think this is just a small initial bill and the final total will be much greater. At more than twice the budget for primary education, the cost is already obscene. One has to ask why the taxpayer should be bailing out a disastrous management that has personally profited from the results of their errors. The next question is why the taxpayer should present a new management with a solid gold hello. Logic says that either Northern Rock should have been allowed to go into Administration, or the Government should have nationalized it to safeguard the taxpayer funding that has thus far kept it out of Administration. Scottish Chancellor Darling is the new Blunder Mouse. 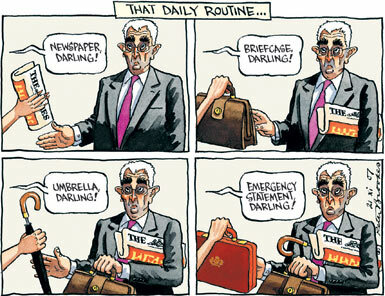 His daily routine is now defined by the latest blunder at the Treasury. Very few politicians have demonstrated such an unerring ability to stagger into a new disaster every day. What’s it today Darling? Is this Bottler Brown’s VISION? Latest polls show that Scottish Prime Minister Bottler Brown and Scottish Chancellor Darling are now regarded as less competent than John Major and Norman Lamont, but less funny than two other clowns, Laurel and Hardy. 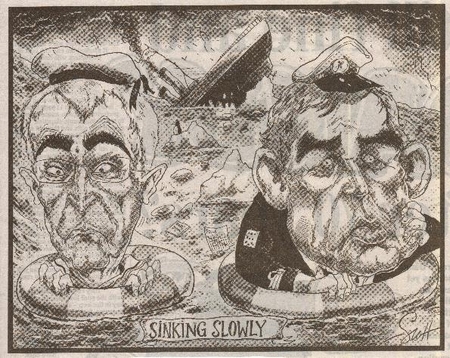 The Blair Brown regime was founded on a very successful trashing of the reputations of Prime Minister Major and his ERM disaster Chancellor Lamont. The irony of the Major Administration was that Lamont’s successor Clarke turned the British economy round and created the golden legacy that the Blair Brown regime has spent a decade destroying. After the ERM Disaster, the Major Administration suffered one problem after another and the Blair-led Opposition took delight in exploiting that situation. Now it seems that what goes around comes around and Bottler Brown is on the receiving end. The sad part is that the real losers are the British people. Bottler Brown promised to stop using spin – so its just another broken promise then is it Bottler? The missing CDs containing the personal details of 25 million Britons were lost by TNT according to the initial spin from the Blair Brown regime. Then they claimed the disks were still on Government property so everyone could relax. Then the search spread to two other mail companies, DX and Royal Mail. The search began to concentrate on a Royal Mail sorting office in Northern Ireland – but still no disks. The blame was first put on a 23 year old junior clerk who was taken to a safe house (no reason was given for this but it could have been for aggressive debriefing by MI6 or it could have been extraordinary rendition to Egypt) Advice to the clerk when he is released – Don’t go walking in the woods. It turns out that senior managers were fully aware of plans to save money by sending the disks in unregistered mail without even proof of posting. 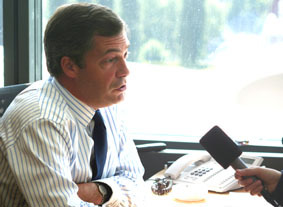 UK Independence Leader, Nigel Farage will be a guest on “Question Time” Thursday November 29th. Also on the panel will be Tory MP Alan Duncan. The remaining members of the panel will be confirmed at a later date. The programme will be broadcast on BBC1 at 10:35p.m. An area of great confusion has been around the claim from the Blair Brown regime that David Kelly gave ‘unauthorized’ information to BBC journalists. Norma Baker has covered this issue in his book although in a number of separated points. The confusion is generated by the way in which Britain, and many other democratic countries, set up and staff their intelligence services. The James Bond school of intelligence is a long way from the reality, which is more accurately presented by the fictional Smylie character. The real core of any intelligence service is its information systems and the skills of analysts. It recovers raw data in many ways. In recent years over-dependence on technology has resulted in SIGINT (signals intelligence obtained by monitoring communications systems) and PHOTINT (photographic intelligence originally from airborne cameras but now more commonly from satellite surveillance and often radar and infrared images rather than photographs) providing a major percentage of total intelligence input. HUMINT (human intelligence collected by spies, traitors, independent contractors, embassy staff, businessmen) has been making a comeback with the belated realization that it provides information that cannot reliably be collected by technology. Much of the intelligence gathering process is not glamorous. It is mostly mundane, carried out in a typical office environment using computers and telephones, reading newspapers and magazines, and in meetings. The computer increasingly takes over the most tedious tasks and is very good at sorting quickly through a mass of information. The greatest enemy of intelligence services is not the difficulty in collecting information, but in extracting those nuggets that are most valuable when recovered quickly and accurately from the mass of information. It is not uncommon after some disaster to find that the warning intelligence had been obtained well in advance but no one had appreciated its value in the mass of other information. There are also information sources from research work conducted by government employees and from ‘friendly’ commercial organizations. Dr David Kelly started off his career as a Government scientist, working as a micro biologist on germ warfare projects. His work was primarily in developing counter measures to germ and chemical warfare agents that might be used against British forces in battle or against the civil population at home. He was very good at his job and received promotions. He reached a stage where he could have enjoyed more rapid promotion had he wished to move from practical work to management duties. He chose to remain as a practitioner but he did receive promotion and recognition through pay upgrades and his unique skills made him a natural for inclusion in the various inspection teams that were being set up with the ending of the Cold War. The result was that David Kelly was a much more senior public servant than is apparent from any entries in the Civil Service Yearbook. The CSY is often misleading in respect of public employees who are working in some military and intelligence areas. One particular intelligence worker was listed for many years as working at a relatively junior level in the Ministry of Agriculture, before vanishing from the yearbook after another promotion. In David Kelly’s case, he was later working in the MOD and particularly in the Defence Intelligence Service community, but regarded himself as an employee of the Foreign and Commonwealth Office, this department of State paying his wages. He was also employed in inspection teams under various international arrangements. An important part of his work was to acquire information and make this available to the British Government. Particularly for inspectors who are part of UN inspection programmes or some other multi-national inspection, this duty of passing information to a national intelligence service is always a controversial issue. To obtain information and to maintain a working relationship with journalists, people working in the areas David Kelly worked have to be able to pass out some information. That is a recognized part of the job. It also has to be largely at the discretion of the individual intelligence worker because there is rarely the time available to go to a superior and request formal written permission to release specified information. In David Kelly’s case, he was working at a senior level, had many years of performance that could be measured and was known to be a responsible and honest public servant who had demonstrated, over many years, good judgment. There are a number of people working at a similar level within the intelligence community who have equivalent duties and general authorization to talk to people outside, including journalists. However, there differences between particular departments, with FCO generally having a more relaxed view on these discussions than the MOD does. In part that reflects the diplomatic nature of FCO and the different environment in which it works. The result is that David Kelly was not only authorized to talk to journalists, but actively encouraged on occasions when it suited Government. It is probable that David Kelly never ever received a specific instruction or authorization. He was of course expected to report back at some convenient time so that his superiors had an appreciation of what was going on and could require some modification of approach. There is plenty of evidence that David Kelly met journalists on many occasions over many years to the point where some journalists were more friends than business acquaintances. When David Kelly met with Andrew Gilligan and met or spoke with other journalists, he was doing so under the general terms of his remit and that can be argued as authorization, even as instruction. The time, date and content of those meetings was not specifically authorized in writing. That means that Government is able to deny all knowledge and responsibility and claim that the event and information was unauthorized, implying, falsely, that it was expressly forbidden. Baker has given some examples of earlier press briefings given by David Kelly to selected journalists, demonstrating correctly that this part of his job was not secret and was in fact known to his superiors, who had made no attempt to prevent him doing so, or disciplined him after the event. Generally, someone in David Kelly’s position is providing background information to correct any research mistakes by journalists and although some information may still be protected and not to be discussed, much of the area of knowledge can be discussed in broad terms. That the content of the discussions with BBC journalists was highly embarrassing to the Blair Brown regime, is so because they had set out to deceive the British people and allies abroad. David Kelly may have been skating on thin ice, but he had not been specifically instructed not to discuss the matters and, in providing general back ground guides to a journalist to encourage accurate research and reporting, it was broadly in line with established and accepted practice. PFI – sub-prime mortgage Government credit crunch? As the great British IT Disaster unfolds, the emerging culprit is the PFI contract, so beloved of Bottler from his days as Chancellor. The PFI, Private Finance Initiative, AKA PPP, Private Public Partnership, is more than a Blair Brown regime propaganda sound bite. It is an interesting form of new stealth tax. It is emerging that the real reason for the IT Disaster, where 25 million Britons have been exposed to fraudsters and other criminals, is that a PFI supplier demanded more money than HM Revenue and Customs were prepared to pay to cover work to select the very limited information requested by the National Audit Office, to allow them to carry out their duty of auditing the Child Benefit system. This meant that cost cutting was placed above the welfare and safety of 25 million Britons, many of them children. In itself this is a major scandal and a scandal that really took place on Bottler Brown’s watch as Chancellor, to emerge on his watch as Prime Minister, suggesting that the honourable course would be for him to offer his resignation to HM The Queen and return to private life. This would be justified on this scandal alone but it is emerging that there are a series of serious failures in addition to the scandal that became public this week. In many ways it is an unedifying story of cowardice, not just the cowardice that we are coming to associate as a central strand of Bottler Brown’s character, but Tony Blair’s cowardice in not firing Bottler as Chancellor long, long ago. However, the real scandal is far greater than the emerging IT Disaster. It can only be understood fully by looking at the history of PFI under the Blair Brown regime. Study suggests that it may hold huge risk in a new credit crunch of sub-prime mortgage proportions. At its heart lies the Blair Brown regime’s dependence on spin over substance and the urge to conceal and deny, almost for the joy of being devious and getting away with it. British Governments once prohibited rental and contract services. The fundamental principle was that the State only took responsibility for those things that could not be done by citizens for themselves. Those public services were provided by creating and staffing a bureaucratic agency, which would also need capital projects funding. Each year the Chancellor of the day prepared a Budget where he estimated how much money he would need in the coming Fiscal Year to pay for these public services. He set out where the money was coming from. Much would be raised in taxes, but some would be borrowed on the money markets and paid back as Government finances permitted. This was a clear and transparent system with two disadvantages. If the Chancellor got his sums wrong, Government would either have to borrow the shortfall, or introduce additional taxes, or find cuts somewhere in the expenditure to balance the books. Cuts usually meant postponing purchases or reducing services, usually in health, education, or defence. The second issue was in spending dates. Once money had been allocated to departments, they had to spend it before the end of the Fiscal Year. If they failed to spend the money, their next estimates were cut back by the Chancellor, on the grounds that they had over estimated need in the previous Fiscal Year and could manage on reduced funds. The result was that each new Fiscal Year started with a period of very low spending which then increased dramatically in the final months of the Fiscal Year as departments rushed to spend all of their current allocation. There was also one further difficulty with the system. When a new hospital or school was required, the Budget had to include all of the capital funds required for payment in the forthcoming Fiscal Year. That then either required additional tax income or borrowing and it was immediately visible in the accounts. This could create all sorts of difficulties for Governments particularly when a Government held power by a slim majority, leading to bitter debate of every policy and political pressure being exerted by the Opposition in return for letting some spending through. In Britain the situation was made more difficult because a series of Labour Governments had tried to bring huge areas of private and commercial activity within public ownership and control. That had resulted in a huge expansion of bureaucracy, massive waste and a rapidly deteriorating social environment. There were a number of areas of Government financing that needed reform and the Conservative Governments under Thatcher and Major looked at ways of reducing or removing the annual spending frenzy, the budget overruns, and the need to hire in some services rather than directly employing civil servants and raising funds for capital expenditure. In particular to reduce the size of Government and obtain value for money in those areas that remained. One area they looked at was PPP, as it was then known. PPP had produced some advantages for those countries that had used the approach to fund major infrastructure projects such as dams, bridges and tunnels. These large projects were funded directly by the companies or consortia that won the contracts to build them. Government repaid some money in stages and the builders were allowed to charge some form of rental or toll to complete the payment. One typical contract gave the builder, who might be a local authority subcontracting most of the construction work to contractors, a number of years when they could charge users a toll. At the end of the period, the bridge or road became State property and the State was responsible for maintaining or replacing the road, possibly under a new PPP. Where the project was a well-defined capital acquisition, PPP usually worked very well, delivered the project much earlier than when a Government had to raise money in one large lump, and often took care of the maintenance issues. The disadvantage was that it committed a future Government to expenditure. Most democracies are very keen to avoid that form of burden on a new Government that has been voted in to replace the one that made the PPP commitment. The usual mitigation was that Government payments were made in a current Fiscal Year and then the organization building and running the facility charged the users some form of fee. At the end of the contract period, the Government of the day either acquired a new asset without any payment, or had an option. The option might be to pay one final amount or to allow the supplier a further period when they could collect tolls. That decision was a decision for a current Government. Another system looked at was the United States Federal Government GSA, General Services Administration, programme. GSA was an interesting procurement system that had produced good results for US Administrations, buying virtually anything Federal Government might require. It also had its critics and like any system it was not flawless. The Thatcher Government looked at the principles rather than the details and in the end adopted some parts of the GSA system, particularly in MOD procurement. One GSA service was a catalogue purchasing system negotiated regularly with suppliers of smaller items, such as computer equipment. In effect, GSA negotiated a bulk discount price with a small number of suppliers and then Federal Agencies could make relatively small purchases from the catalogue without having the expense and delay of running a competitive procurement just for a few Personal Computers or a new set of computer printers. In reality, the GSA catalogue came to be used creatively by some Agencies and there were other issues in the detail, but the principle was very sound. MOD adopted the catalogue in a slightly different form in detail, but the principle was that products were paid for as needed from current approved budgets within the current FY. The suppliers committed to a price on expectation of business but Government gave no guarantee of how much business would go through the catalogue. GSA also enabled Federal Agencies to procure products and services under rental or leasing arrangements. Some of these acquisitions could form very large projects and represent major expenditure. The GSA system neatly got round some of the potential difficulties in renting. Contractors had to agree that they were only guaranteed payment for the current FY. On the face of it, this looked like a system that forced suppliers to accept significant commercial risks. In reality, it worked very well for both parties most of the time. The supplier decided how long the rental would last and calculated the monthly or quarterly price accordingly. If the Agency was unable to obtain funding for the second or subsequent year payments the supplier took the hit and removed the equipment. In reality, that very rarely happened. When it did happen, another Agency could take over the service or system at the current agreed price, which was usually cheaper than taking a new contract to meet that Agency’s needs. There might be a relocation fee, but supplier and Government were both happy and Federal Government had accepted no commitment beyond the current FY, or imposed commitment on a future Administration. The Thatcher Government decided that the US system would not transplant to the UK and one reason for that was that British Governments do not serve fixed terms. The Blair Brown regime is currently half way through its forth term in Government, although it has only been in office for a decade which is only just over the period of two full terms. Each Administration is elected for a period, which only has a maximum term. If a Prime Minister decides to end his or her Government, application is made to HM The Queen, as Head of State to accept the resignation of the Government and the calling of a General Election to vote in a new governing party. 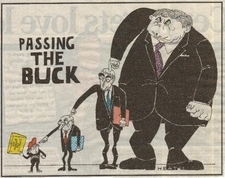 The Thatcher Government accepted that any new Government should be free to introduce a new Budget, which significantly changed policies and expenditure. However, the requirement to introduce new roads and information systems presented several challenges and it was decided to try out some of the principles of GSA for specified major procurements. This led to some evaluation contracts being placed under the Major Administration, before the Blair Brown regime took power in 1997. One evaluation PFI contract was for information systems for HM Treasury and there were soon differences between Government and the contractor, which emerged in the early days of 1997. Although “Bottler” Brown, as Chancellor, must have been acutely aware of the difficulties, he fell deeply in love with PFI. It appealed to him because it could be horribly complex and bureaucratic and because it allowed him to hide huge amounts of Government financial commitment. A thirty year PFI contract for a hospital only shows in each FY as the amount paid in that year and can include staffing costs, reducing the public employment roll. The annual costs will rise steadily and, in some years, very rapidly. That original Treasury PFI system became increasingly sour and resulted in HM Treasury threatening to take the supplier, a large US company, to court. In the end the supplier agreed to pay back millions of pounds, but only if the Government guaranteed to place significant new business in compensation for the repayments. In effect, the supplier was saying, “you know you don’t want the publicity of fighting through the courts and you know we are big enough to make it a painful and costly process, but there is a solution. We will offer to repay large amounts of money to compensate for the failures on our part under this contract, provided that you guarantee to give us a long line of new highly profitable contracts that will allow us to recover every penny we pay you back on this contract and new profit”. Of course Brown ‘bottled’ it and gave in. Subsequently HM Treasury has made several attempts to change the terms of that agreement to resolve supply failures, but the supplier has continued to prosper and take new highly lucrative contracts from Government, in some areas forming a monopoly to all intents and purposes. The supplier is currently at the heart of yet another IT supply scandal, this time with MOD on a contract originally estimated at GP£4 billion, now revised to GB£5 billion, and likely to exceed GB£9 billion, or accept a greatly reduced functionality. 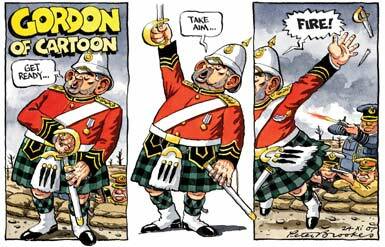 PFI has been employed by the Blair Brown regime on an epic scale. The amount of forward commitment to commercial organizations is enormous and stretches far into the future, some contracts apparently being for thirty years. It is beginning to look as though Blair and Brown hoped to create their Hundred Year Reich by putting Britain in hock (debt) for a hundred years. Solving this problem will be an unenviable challenge for the next Government and that Government might be formed in the next few months, and certainly within the next two years. It would be unfair to attempt to blame the commercial companies or the principles of PFI. Companies have been doing what they are there to do and that is to maximise profit. In the overwhelming proportion of PFI contracts the Blair Brown regime has simply been out-negotiated. Lawyers and salesmen working for PFI providers have ensured that maximum risk is transferred to Government and away from their employers. At each turn they have proved more nimble and capable. The Blair Brown regime is victim to its own greed, arrogance and ignorance. It has prospered politically by using propaganda to spin the unbelievable hidden commitments to funding hospitals, schools, quangos, bureaucracy and non-jobs into a triumph for fiscal prudence. That’s just like any of us rushing out and signing a host of agreements for things we cannot afford and trying to convince everyone else that we are just very wealthy prudent managers of our personal budgets. Eventually, we either have to make some very tough decisions to clear the debits, or watch the eye-catching assets being repossessed. PFI suppliers may yet come to cry foul as a future Government attempts to get to grips with the lavish and badly negotiated contracts, but that will be much like the banks who now cry foul over their profligate sub-prime mortgage spending. They took huge risks and made huge profits that were distributed in bonus payments to management and to stockholders. The real victims are the unfortunate poor who were persuaded to take out mortgages that they had no means to repay. If the banks suffer a cut in their standard of living it will be nothing like the hardship experienced by the poor they exploited. In the same way, the people exploited under PFI are not politicians but the people of Britain. They will have to pay the butcher’s bill because Governments have no money, only the money of the people. For example, the rash commitments, made recently by Chancellor Darling, to save Northern Rock, translate into a new tax burden of more than GB£1,000 for every person in Britain – the final bill may be far higher. The curse of badly employed PFI is that the pain continues long into the future. In thirty years there may be towns and cities that have only an obsolete, broken-down PFI hospital that is now paid off by near useless and where there is no money available to pay for the doctors and nurses to work in its crumbling shell. To this is added the ‘cost-plus’ aspect of PFI contracts. Once the basic contract is signed, the supplier can offer additional non-competed services. The bill for those services can be very high because there is no real pressure on the supplier. As in the case of the IT Disaster revealed this week, the supplier appears to have said, in effect, is, ” what you ask is not in the contract, but we would be pleased to supply it for an additional extortionate fee.” Unable, or unwilling, to pay, HM Treasury and Customs appear to have told a junior clerk to make two CD copies of and entire database and toss them in the unregistered post to save money. The problem is made far worse because the Blair Brown regime façade has been propped up by encouraging very high levels of personal debt in addition to the huge invisible mountain of PFI debt run up by the Government. That is already producing its first victims and the numbers of personal bankruptcies and house repossessions continues to rise to alarming proportions. This may lead on into a serious recession where almost everyone loses. Behind it all is a decade of disguised fiscal profligacy and irresponsibility on an epic scale.